There are a few planes in existence that I want to fly solely because the planes themselves are cool. For example, I redeemed airline miles to fly first class on Etihad’s A380 this upcoming winter. That aircraft features a shower and individual couches for first class passengers, plus a bar. Earlier this month I flew Qatar’s A350 which is one of the newest/most advanced planes in the sky. Another plane I really wanted to fly was the 747, specifically on the upper deck of the 747. The 747 is a majestic aircraft for several reasons: 1) it has an small upper deckthat seats about 20 business seats (the 400 model), 2) it was the first wide-body aircraft, 3) it held the aircraft capacity record for decades, and 4) it featured an iconic spiral staircase that connected the upper and lower decks. The 747 is an endangered species; it is quickly being retired for more fuel efficient aircraft (787, A350). Thankfully I snagged a seat before it was retired, which will likely happen in the next decade. 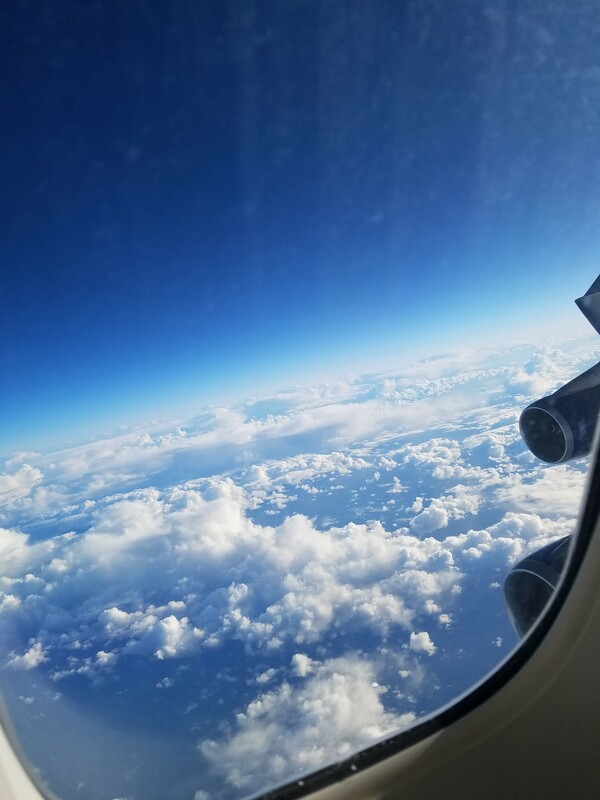 I’ve wanted to fly in the hump of a 747 since I was a child. 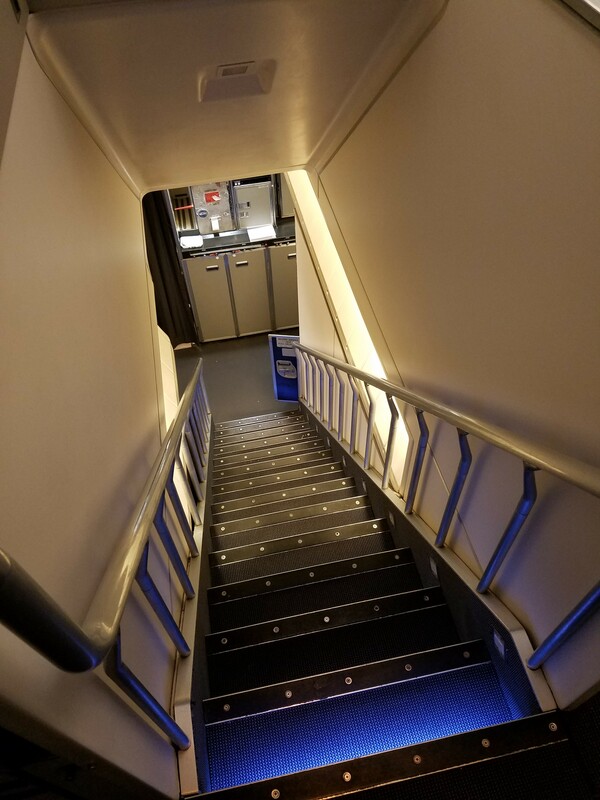 Upon entering the plane, you are quickly ushered to a staircase that takes you to the upper deck. In the 70s, the staircase was in a spiral and the upper deck was commonly used as a lounge. It’s still pretty cool to have to climb a staircase in an airplane though. You can’t tell this from the photos but the interior of the upper deck was very quiet and calm. Engine noise was kept to a minimum and the only people walking in the aisle were headed to the bathroom. One of the first things you’ll notice about the aircraft’s interior is its nice off white/ aging yellow color. This picture was taken from the rear of the upper deck so you an see all of the seats. There is one restroom in the front of the cabin and one at the rear. The stairs are located immediately to the left of the photo. The business class seat was not particularly special. I liked the fold down footrest and the tray that did not need to be fully extended to work properly. Unfortunately, the screen was floppy and wouldn’t fully open. The biggest issue with the seat is the translucent barrier separating the seats. It’s located on the right side of the photo and it is retractable. You can’t put it up until after you watch the safety video, so you and the other person are staring at each other until then. It’s hard to tell from the photo but the person in the window seat in the row ahead of me would need to climb over my footrest every time he wanted to use the rest room. Thankfully he had a bladder of steel because that was not an issue. 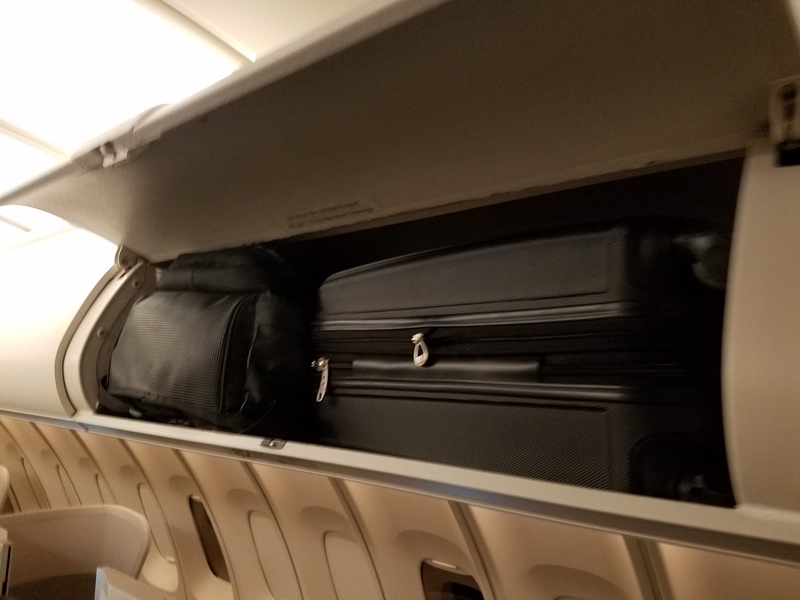 The overhead storage bins are smaller than usual overhead storage bins, but they can still hold a roller bag and a stuffed backpack. Not all seats on the upper deck are created equal. The window seats that border the exit row have direct aisle access so those passengers do not need to climb over the aisle seat to use the bathroom. 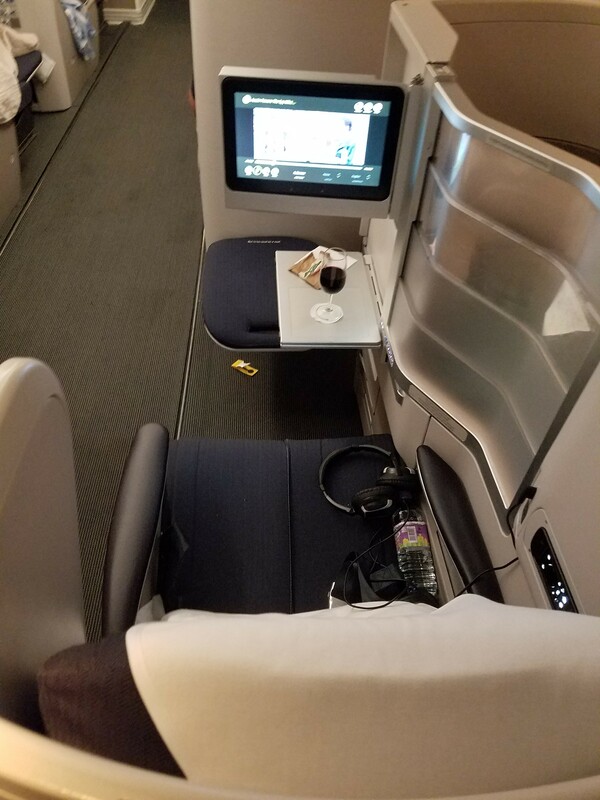 British Airways provided each seat with a blanket, headphones, bottle of water, and amenity kit. Unfortunately, I unexpectedly fell asleep in the upright position and did not use either. The head phones were not as good as American’s Bose headphones, but they blocked out a decent amount of cabin noise while providing good sound quality. There were not many options available because this was a red-eye flight. In fact, I was the only person who did not sleep the entire flight. I ordered one of everything they could serve me and the tray (pictured below) arrived. The pita, hummus, and cheese cuts were pretty good but I did not try any of the vegetables on the back plate. I tried the Port but I did not enjoy it as much as American Airlines’s Port (although I’m hardly an expert). The beer options were essentially the European equivalent of Budweiser. One of the cool features of the upper deck is that it has its own dedicated flight attendant (I think we had two) which meant the service was great. The flight attendants were significantly more attentive than attendants on my other flights. I was the only person awake for several hours but the flight attendants did not take a break or decrease their service one bit. 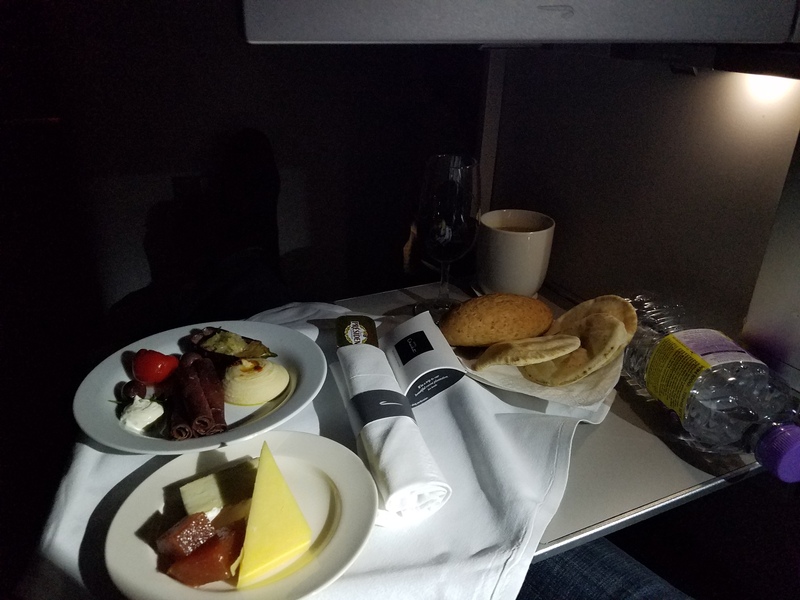 When I explained that I haven’t eaten (I thought the plane would serve real meals), the flight attend told me not to worry and he would see what he could whip up. Apparently British Airways does not care about seat assignments. Each time I’ve flown British Airways I’ve had at least one seat reassigned with no notice. I was particularly irritated on this flight when my seat was reassigned from the upper deck to the lower deck. I booked a layover in London (over a direct flight) because I wanted to fly in the upper deck of this plane. Thankfully the plane was delayed (along with EVERY other plane I flew (5) on this trip) so some folks needed to be rescheduled. This opened up one seat on the upper deck and British Airways put me in that seat. I complained about the initial seat reassignment to every British Airways customer service person I saw that evening and thankfully they were able to come through. That whole ordeal could have been avoided if British Airways honored seat assignments. I called customer service to complain and they said an aircraft switch prompted the change. The aircraft were indeed switched out but that occurred 1) after the seat reassignment, and 2) the new aircraft had an identical seat figuration. This aircraft was old and the interior was tired, but walking up stairs in an aircraft is pretty cool. 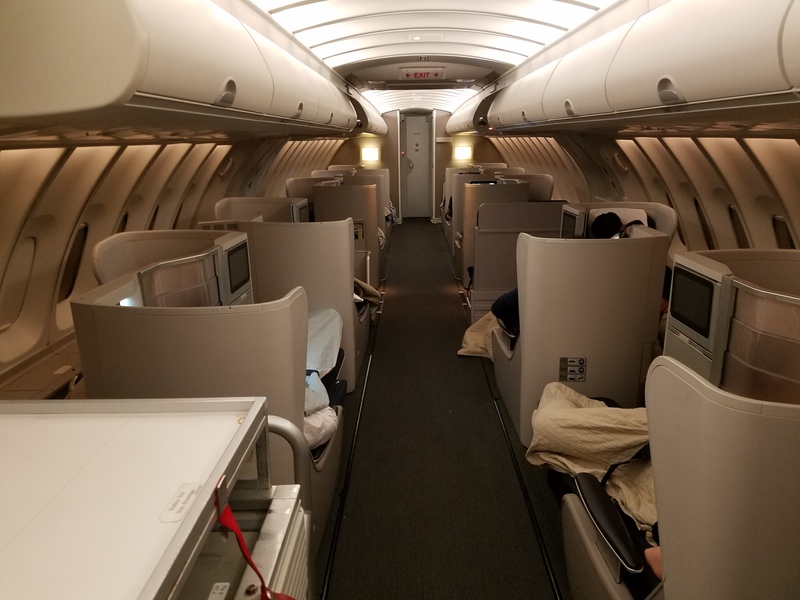 This may be my last flight on the upper deck of a 747, but I am so glad I had the opportunity to fly it before its retired. 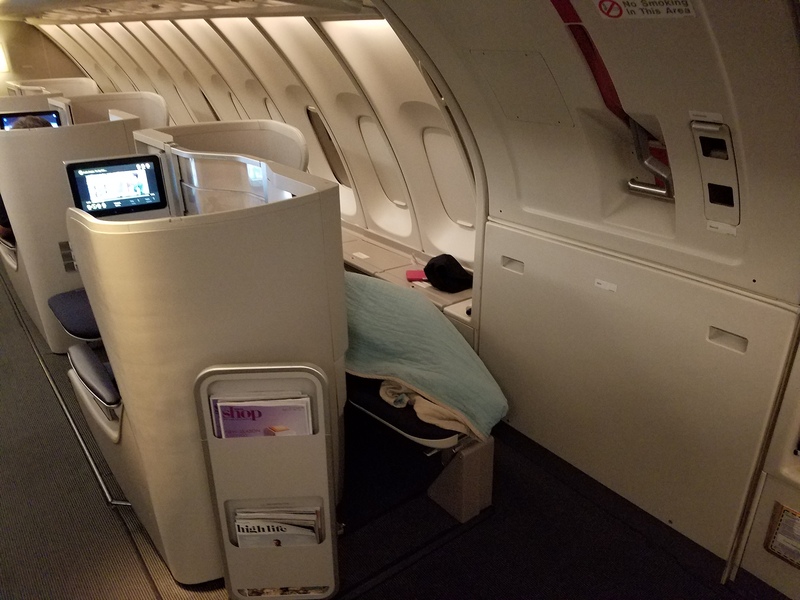 Be the first to comment on "British Airways 747-400 (Business Class) – Riding Up Top"